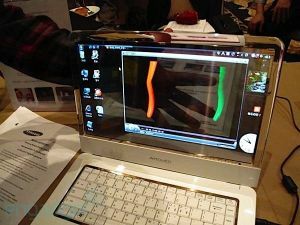 Remember Samsung 14" transparent OLED laptop? PlusPlasticElectronics says that Samsung actually plans to release this laptop as a real product within 12 months. They also reveal that the IceTouch MP3 player will sell for around $330 and will be released in the US in the first half of 2010. Samsung wants to dominate the transparent display market, and plans to introduce a range of new products with such displays within the next year. They will even consider products not normally produced at Samsung - such as a transparent automobile navigation system that can be placed on a windscreen. Now how about a transparent OLED TV? The transparent screen looks cool but I don't think it's practical since you would have to be very particular about where you place and use the laptop. If you were sitting in front of a window, like at an airport, you might not be able to efficiently view the screen; especially text, this could cause eye-strain. Consider the issues with glossy screens on laptops; glare becomes your mortal enemy. Another problem is privacy, can the people on the other side of the screen see what you see? For special displays such as sat navs, command centres, stock exchanges, presentations, and so on, transparent OLEDs will find their market. But a general purpose laptop? What would be the point? What advantage would having a transparent screen afford, except "cool factor"? I'm not saying this to criticize the idea, I genuinely cannot think why anyone would want it apart from coolness? Any thoughts or example applications people can think of (for general purpose laptop)? Might be useful for movie viewing or presentations. Or for paranoid bosses to discourage workers from slacking -- granted they don't deal with sensitive information. Maybe a blur screen could be placed on back as a privacy compromise. Samsung to use transparent AMOLEDs in optical camera viewfinders?